It’s Day Two of 24 Tags of Christmas week!! This time we’ll be playing with Zig markers – and a way to make a thicker shaker card, for those larger blings we might want to use! I decided to stamp and diecut out of Ranger’s Distress Watercolor Cardstock – for one, it’s extra-white, and for two, I have a stash taking up a spot I want to use to store something else. LOL. Crafters problems, right? And the die set has beautiful pierced details…so pretty! Watch the video below or click HERE to see it in HD on YouTube. You can see all the tags from all years in the 24 Tags of Christmas Gallery! Tradition is to give away the 24 tags…I’ll pick 24 winners from blog posts and YT comments, so leave some love and maybe you’ll win! Woohoo! Love shakers and this little stamp! Enjoying your tags every day. Merry Christmas! I love shaker creations! These tags are so cute and the little guy is so adorable! This is so cute. That tag is fabulous and the paper is awesome! Oh my! I just love this tag! I’m a dog lover and love stamps that use them as their theme. I have all these zig markers so I can so seeing me incorporate this idea in my holiday cards/tags. Thanks again so much for all your inspiration. Perfect for the animal lover! Great little shaker tag and love the idea of the markers. I will have to look for them. Great video. I love the idea of shaker tags! And to stamp the wrapping paper! I just love the bright colors – this is so adorable! Too cute, what a lovely idea. Love the shaker and the sweet puppy. How adorable! 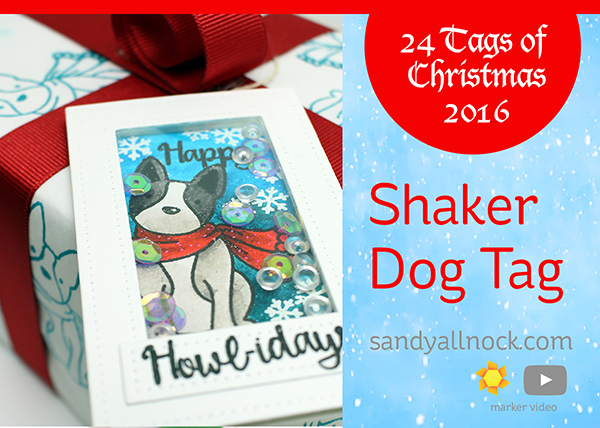 A shaker is a super idea for a tag! A bit of bling on the front of a package.